Google Page Rank… How does it work and does it really matter? My clients often wonder what Page Rank is.. (PR) is an acronym for so many things and here’s yet another one. If you are a local retail business selling your goods or services to the surrounding area your page rank is most likely never going to be all that high but does that matter to you? Probably NOT! You can still rank very nicely on Google organically if you do the things I’ve talked about before.. Listen to Google.. follow the Webmaster Guidelines and provide interesting and unique content (aka not copied from another site) and you can be seen on page 1 google for your keywords. People think… “If I link to a whole bunch of great sites that increases my page rank… right?” WRONG! You linking to other sites “may” help THEIR page rank but it does nothing for yours. 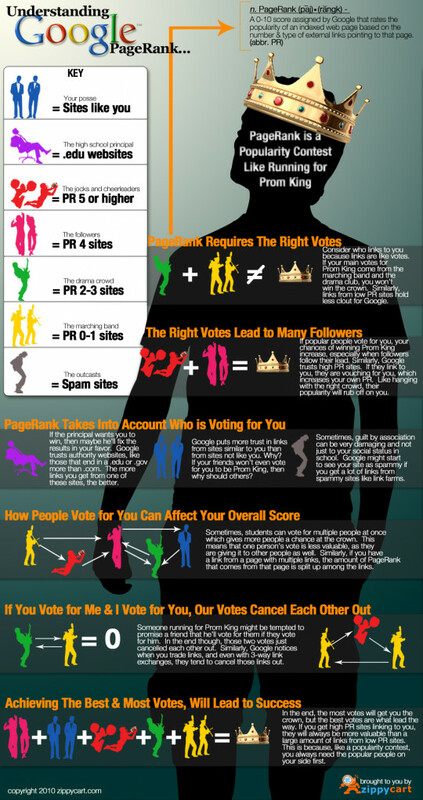 If you build a great informational page to lots of great resources that have to do with your topic or business type then OTHER people might link to that page because your page is a great directory….. THAT link is what you are hoping for.. A vote for you (your website) that you earned because of great content. “What if I link to someone and I get them to link back to me?” No points! Your votes essentially cancels each other out.. The infographic from ZippyCart below is a great illustration of how it works. Enjoy. Need help with getting your website to show up on Page One Google? I specialize in just that. Browse the rest of the website and if we are a fit contact me here. Maybe I’ll be YOUR Web Chick.